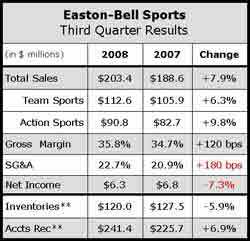 Easton-Bell Sports, Inc. chalked up healthy sales increases for both its Team Sports and Action Sports divisions. From a bottom-line perspective, the Team Sports division particularly benefited from a shift to offshore production and both divisions benefited from an ability to increase prices to their customers. In the team sports division, which includes Easton and Riddell, revenues grew 6.3% to $112.6 million from $105.9 million due to strong growth in ice hockey equipment and modest growth in football equipment. Those gains offset by decreased sales of baseball and softball equipment and reconditioning services. Team sport's gross margin improved 3.4 percentage points to 41.7% as cost savings realized from transitioning the manufacturing of certain aluminum products from the U.S. to Asia and increased selling prices to its customers offset by the negative impact of foreign exchange rate movements. Operating income in the team sports division grew 13.1% to $22 million from $19.5 million. In the action sports division, which includes results from the Giro and Bell brands, sales advanced 9.8% to $90.8 million from $82.7 million. Gross margins for the division decreased to 28.6% of sales from 30.0% last year due to increased product costs and inventory reserves, partially offset by increased selling prices to its customers. Action sports' operating income increased 6.2% to $11 million from $10.4 million. Easton-Bell noted that mass channel sales reflected double digit growth and specialty channel sales were up high single digits in the quarter across both divisions. Overall gross margins increased to 35.8% from 34.7%. SG&A expenses increased to 22.7% of revenues from 20.9% due to investments in information technology, incentive compensation, employee termination costs, equity compensation, product liability and variable selling expenses related to increased sales, partially offset by a reduction in marketing expenses. Income from operations nudged up 3.6% to $23.4 million from $22.6 million as the gross margin and sales gains offset the higher selling expenses. Net earnings slid 7.3% to $6.34 million from $6.84 million. Interest expense was reduced to 6.8% to $9.5 million from $10.2 million but income tax expenses grew to $7.6 million from $5.6 million due to a significantly higher tax rate. Adjusted for foreign currency changes, comprehensive income was $5.2 million in the latest period, down from $9.4 million a year ago. The foreign currently translation impact was a negative $1.1 million in the latest quarter versus a positive $2.6 million a year ago. Adjusted EBITDA for the third fiscal quarter of 2008 was $31.2 million, as compared to $29.8 million for the third fiscal quarter of 2007, an increase of 4.7%.